At the conclusion of the 2019 season, Tim Pettorini, skipper of the Fighting Scots baseball team, will retire as one of the most successful coaches in any sport in any division in NCAA history. As the daughter of a former Fighting Scots baseball player, I feel uniquely positioned and incredibly honored to write this story. My house has always been filled with stories about baseball, specifically Wooster baseball, and many of those stories revolve around the hard driving, record setting head coach of the Fighting Scots. This reporter had a chance to catch up with Coach Pettorini before the start of his final pre-season at the helm. Chloe Burdette: What has coaching at the College meant to you and your family? Tim Pettorini: It has really been an outstanding experience. I have loved just about every minute of it. Me and my wife Rhoda came to Wooster 38 years ago with a very young family. In the time that has transpired, we have grown, raised a family here and I thinkwe have pretty much become entrenched in the community and the College. When I’m finished coaching we will continue to live in Wooster and enjoy this area, but the friendships and experiences are going to be with us forever. CB: Are there any favorite or memorable moments that stand out during your career? TP: It’s very difficult to pinpoint any special moment because there are so many. We have been fortunate enough to win a lot of championships and every one of those is special. However, I think what I value more than anything are the relationships that have been formed over the years here. When former players come back and bring their children with them, that’s really special. I can’t tell you how many weddings my wife and I have attended over the years. More than any single moment in a particular game, those are the things I value most. CB: What is your focus in your final year of coaching? TP: Winning a World Series would be pretty special to say the least. However, I’m going to try and focus on the same things we have always tried to do. Growing together as a team, improving as the season goes on and competing at the very highest level we are capable of. If we do those things, this will be a very special season and the wins and losses will take care of themselves. I really am going to try to enjoy this season and the games we play and the practices as much as possible. CB: Thoughts on life after Wooster? TP: I hope it will include more travel, spending time following my grandkids and their activities plus all kinds of other things. When I sit back and think of all of the things I haven’t been able to go and see because of practices and just the schedule of school, I’m really looking forward to a multitude of activities. I’ve never been to the Masters. I think I might want to go see the Indianapolis 500. I’ve never been to a Super Bowl or a World Series game outside of Cleveland. There are some really outstanding golf courses that I would love to play, like Pebble Beach and Oakmont Country Club. There really are a ton of things I want to do and hopefully I will have the good health and time to maybe do a lot of the things on my bucket list. It would be easy to write about all the incredible records and accolades of Coach Pettorini, but as he said, it’s always been about much more than that for him and his players. The indelible mark he has made on the student athletes these last 38 years is the real story. “I’ve been very fortunate,” explained Kenyon Baseball Head Coach and Wooster alum Matt Burdette ’92. “I got to suit up for four years playing for him and have shared the field as a competitor against him for the last 25. The education I received from Coach P in baseball, competition, resiliency and in being a generous person was priceless. No one has done it better,” he said. “Coach P was one of the most competitive coaches I’ve ever known. He was excellent in his preparation, and his intensity before and during games was unsurpassed,” insists Matt Hiestand ’90. Current player Evan Faxon ’21 remarked on the excitement for this season. “One of the things that makes our program special is how much Coach P cares about all of his players, and that’s where a lot of the success starts. He wants what’s best for us and pushes us to be our best, so we’re absolutely going to go out and give our best for his last year,” Faxon said. As he embarks on his final season, we should take a moment to chronicle just how successful the on-field run has been for the Pettorini-led Fighting Scots. He is the active leader in DIII coaching wins with 1,213. 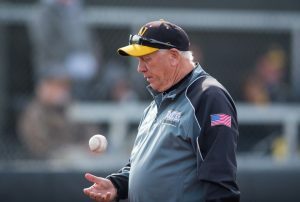 Wooster has won a league-leading 18 North Coast Athletic Conference championships and has made 25 appearances in the NCAA DIII Baseball Championships while winning the Mideast Regional and advancing to the DIII World Series six times. Pettorini is in the top 10 of DIII coaches in all-time winning percentage (.730), and has been selected as conference Coach of the Year 13 times. He’s been the American Baseball Coaches Association DIII Mideast Region Coach of the Year each time the Scots won the regional while also earning his first D3Baseball.com Mideast Region Coach of the Year honor in 2017. With the Scots beginning the 2019 season as the top-ranked team in the nation, it’s safe to assume that Coach Pettorini in his last go-around will add to many of the remarkable accomplishments listed above.